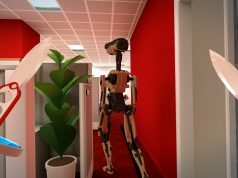 It’s been over two years since Stockholm-based Neat Corporation released the initial prototype for Budget Cuts, an upcoming stealth-action game that throws you into a robot-filled office space and arms you with various throwing weapons and a novel portal-based teleporting device, letting you sneakily stalk the corridors like a knife-wielding Nightcrawler. 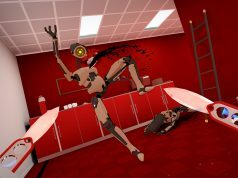 Now that the game has an official release date and price, Neat Corp let us in for the first official taste of the game at this year’s GDC before it heads out to HTC Vive and Oculus Rift in May. Like many people with a Vive in early 2016, I’ve played the Budget Cuts prototype a bunch. 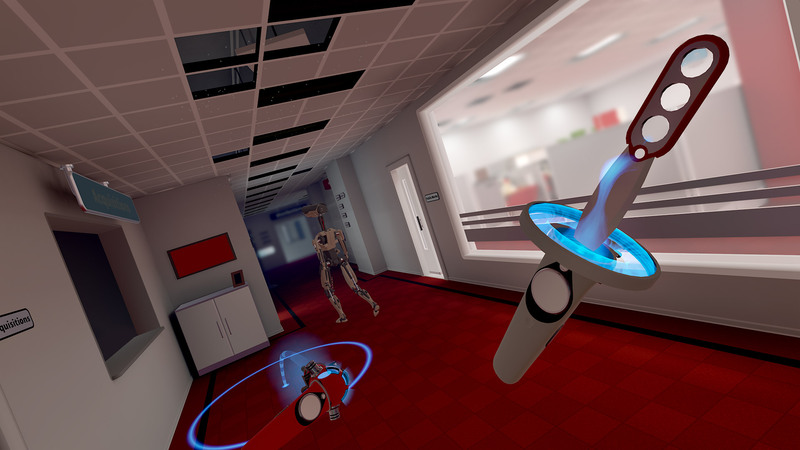 Not only is it still free to download on Steam and showcases an impressive level of polish, it introduced a novel locomotion mechanic that instantly made sense in the context of the world – a teleportation gun that not only lets you traverse the sprawling office building, but also acts as a way to effectively preview your destination by giving you a portal window to your destination. Shooting the teleportation gun and using the portal to check if the coast was clear to accurately position yourself behind your target before zapping over to your new location really added to the game’s mystique and excitement. In that sense, not a lot of the fundamentals have changed from the prototype I played years prior to the Budget Cuts I saw today at GDC, the second level of the game proper. The portal system still works magnificently. Tactically avoiding baddies and popping up behind them is still massively fun. Predictably, there are some notable bits that Neat Corp has scaled back in certain areas and expanded in others in efforts to make the estimated 7 hours of the gameplay more engaging. The robots are scarier by a few percentage points than the big-headed goofs that skittered around on high alert in the prototype. They’re lankier, more imposing, and they don’t die immediately like before, instead requiring an accurate hit to a vital point to fully dispatch, something that only required a single haphazard toss of a knife before. The guardian bots also carry shiny revolvers (you can’t use them yourself) fitted with a laser beam so you know when you’ve got a bullet coming your way. And even on ‘Standard’ difficulty, I did die a few times. Thankfully when I died cowering and screaming, I was reloaded to an automatic checkpoint for another immediate go. The game, I was told, will also come with easy and hard modes which will tune the robots’ hit points, attention, and accuracy. There’s friendly non-combatant worker drones too, although I didn’t quite understand their purpose other than target practice and a few interesting bits of dialogue. Yes, I felt a moral twinge when I stabbed the docile pacifist-bots. Weapons have also slightly changed too. While the throwing knives are still there, you can also toss scissors and darts that you find lying around the office too. The crossbow pistol is gone, as I was told “guns aren’t fun.” In the close quarters of Budget Cuts, I tend to agree. Without the crossbow, my focus centered around perfecting my throwing form since I wasn’t using the game’s optional aim-assist. I wasn’t great at throwing, but it seemed like I was getting better near the end of the 30-minute demo. Aim-assist wasn’t implemented in the build at GDC, but it should be in available at launch in May. The latest demo has also made some changes in terms of lighting. Much of the level was either entirely dark, or entirely light, which I later discovered was because you had the ability to switch lights on and off in certain sections of the level, something you could use to your tactical advantage. To my utter delight, there wasn’t an incessant voice telling you where to go or what to do either, as you’re mostly left alone to figure out the way forward (as far as I know). While there’s a fair bit of signs to read, narrative elements played out via a voice and paper instruction delivered via periodically placed fax machines, requiring you to dial a number taken from your handy-dandy pager. There are also found objects hidden away in desk drawers (all of them open!) that might hold a few more storyline tidbits too. From the demo, I never really got a sense of what sort of puzzles would lay ahead, as most of my interactions involved finding security key cards to get through locked doors. This was admittedly an early level though, so I suspect there’s more varied gameplay in the full release. I also didn’t get a chance to see one of the game’s bosses or get a greater sense of the narrative behind it all. This, I was told, was intentional. Keeping the game well under wraps during its entire development, Neat Corp wasn’t ready to give away anything substantive yet. 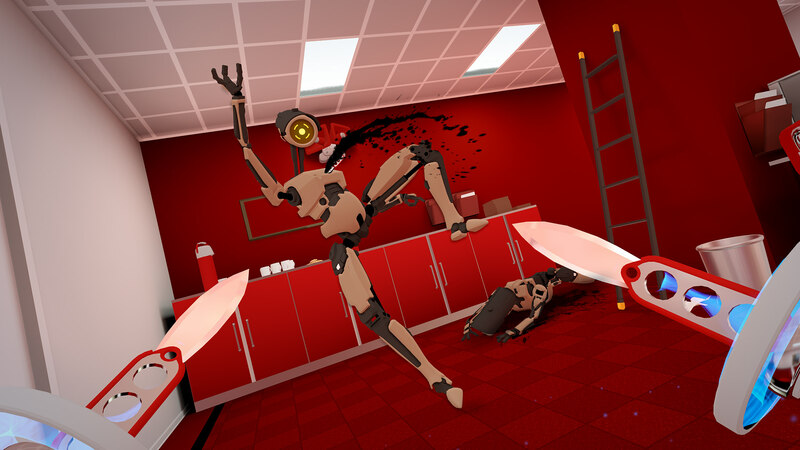 While Budget Cuts is visually cartoonish, sporting the sort of low-ish poly look of games like Job Simulator (2016), a cohesive color palette and fine attention to lighting really helps transport you into the game; it just creeps up on you. Emerging from the darkness, I felt like I really was in the shadows waiting to strike (or die), and as a result, I completely bought into the adrenaline rush. If the full release of Budget Cuts can deliver this for the entire 7 hours of estimated gameplay, well, we might just have another VR-native hit on our hands. I hope to buy this game at D1! super killer application! Luke, may the force be with you. thx! XD also with you! I’ve always felt Budget Cuts was the game to show off VR to the uninitiated. I’ve played through that demo several times and enjoyed it immensely. Glad to hear we have a release date, and Neat can without any hesitation certainly take my money! So excited for this. I may have to dust off my Vive finally. Sounds absolutely awesome and all I had hoped for. Cant wait.